**My Desert Cottage**: A glitter bomb went off in my studio!!! A glitter bomb went off in my studio!!! I've been working like a crazy person trying to juggle work, husband, housework, garden maintenance and studio time. As a result... the typical cleaning that happens between projects is NOT happening. It looks like a tinsel and glitter bomb went off in there!!!! Its finally getting to the place were I want it to be. Every year I seem to run out of steam and never seem to make all the things I want to. Now of course I've discovered Pinterest and the overwhelming amount of ideas is just adding more pressure!!! LOL!!! I hope you are all having fun creating for your holiday!!! All of your ornaments are beautiful. I love the glitter bomb look! I just discovered Pinterest, too. It seems I spend more time looking at ideas then actually doing the crafts! I love these ornaments, they are adorable. your desk has "bling" action going on. Oh Karen they're absolutely Lovely... and if a room must look as if a bomb went off in it, then a Glitter Bomb is perfect for the Holidays, sprinkling Faeiry Dust over everything to give it that sparkle that we adore! Hummmm... perhaps you've Inspired me on how to make this mess look Enchanting if I go about tossing Glitter all over the top of it?!?!??? I've got The Man on Child Care Duty while I do Seasonal Work from 10-7 and the G-Kids are on a Seasonal High, he's busy watching wee ones AND Football *Winks ~ yes menfolk delusionally think they can do both ~ LOL*... so you can only imagine!!!!!!!!!!!!!!!!!!!!! Hmmmm it looks a lot like my studio counter! I just got out some old paper lace doilies to make some ornaments with & the snowflakes! Must be a trend!! Lovely ornaments, Karen!! I understand completely. I have my own private "idea" book of photos online that I love like crafts or home decor. I am beginning to realize that I may have to wait until I retire to start to make any of these things!! Love your ornaments!! They are stunning!! They look beautiful, Karen! Sometimes you just have to go with that creative flow! I love them all! Happy Creating! Stunning! Love them all! My husband came home from work yesterday and took one look at the dog and one look at me and said "I see it is glitter season again." LOL! Not to temp you or anything but I have a new ornament tutorial coming up in the next couple of days, it is vintage paper prettiness, stop by and check it out! Happy glittering! Absolutly beautiful! My favorite one is the first one; the star! They look wonderfully vintage! Your tree will be beautiful...keep going!! They are beautiful! Well worth the mess!!! Glitter Bomb or not these are beautiful. Definitely worth the mess ! These are great. Pinterest...dangerous indeed! 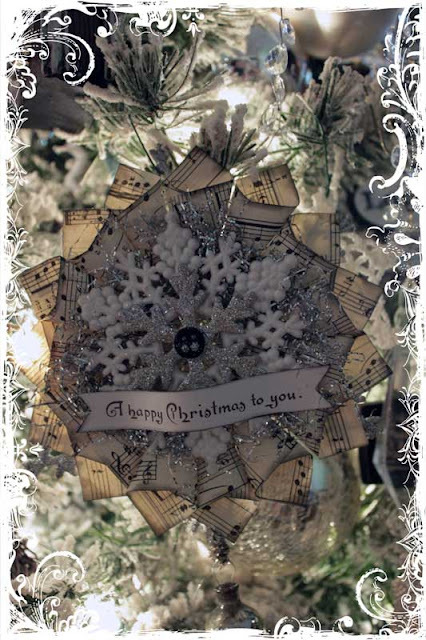 Very beautiful ornaments! Thank you for sharing them with us. I love your new blog design too! Karen - you just rock out vintage! Your ornaments are perfectly aligned with your blog and style! You go girl!! As usual sweetie, I LOVE your style, Christmas looks like it's gonna be magical at your house. Happy holidays! I giggled when I read your title about the glitter. It's everywhere in my house too and I can't get it up. The worst is having it in all the little cracks on my keyboard! No good. Just adore your gorgeous ornies! YOU have indeed been busy. It's not a party until some glitter gets spilled! 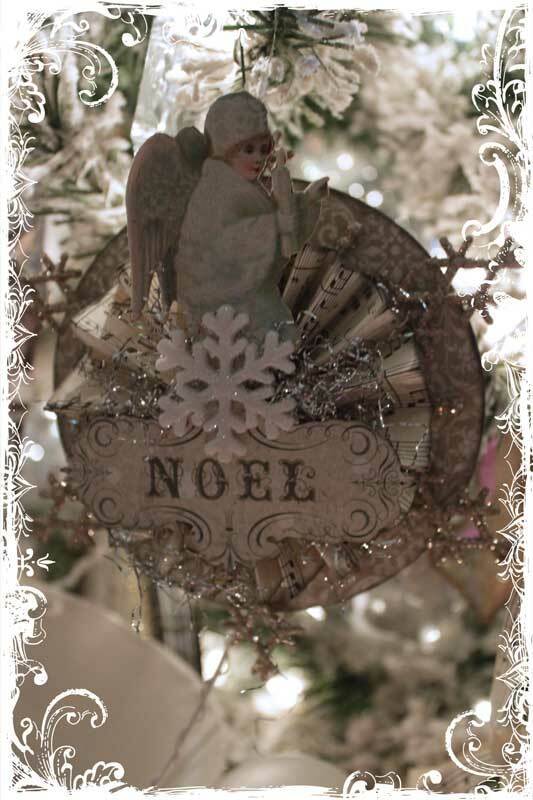 LOVE your ornaments and your house looks FabUlous! Wonderful ornaments! My trees are up with lights on them but no ornaments! I am tempted to throw all my balls up & some burlap garland & call it good! KUDOS to you for not running out of steam! I LOVE the Noel Angel one the best! 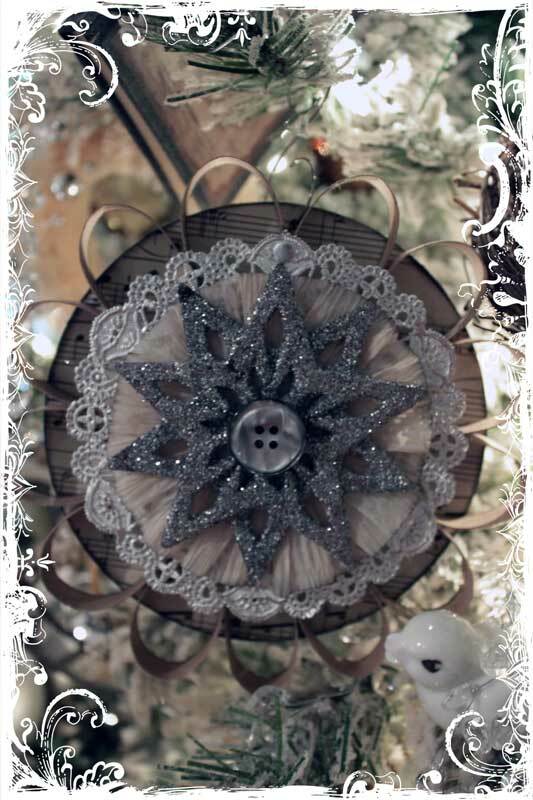 Hi Karen, Love your ornaments, I am also enjoying Pinterest, it's like an addiction! I love both the ornaments and the new look of your blog! I've been making ornaments, too, and a vintage sheet music wreath that is HUGE! Too bad work gets in the way of the fun creativity, though! Pinterest....I love it and hate it!!!!! But I definitely love your ornaments. Your ornaments are beautiful! 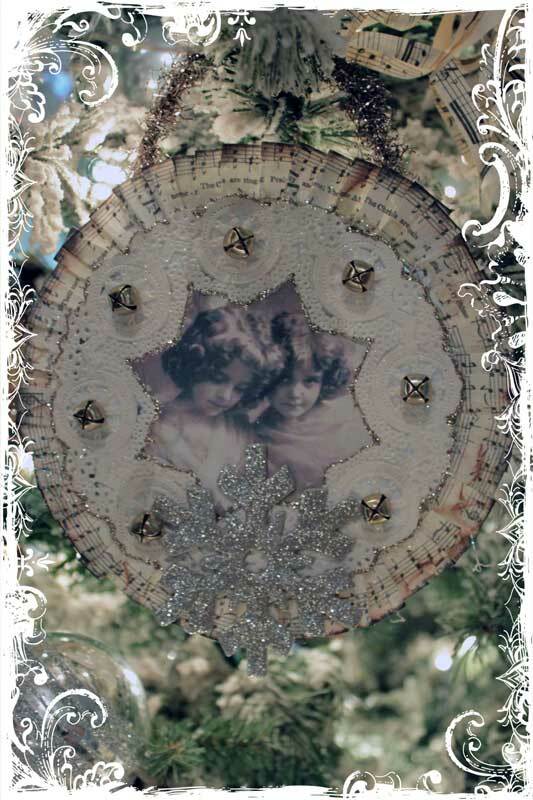 Ornaments are so precious when made from the heart; yours are just that. Hi! Thanks for visiting my little Blog. 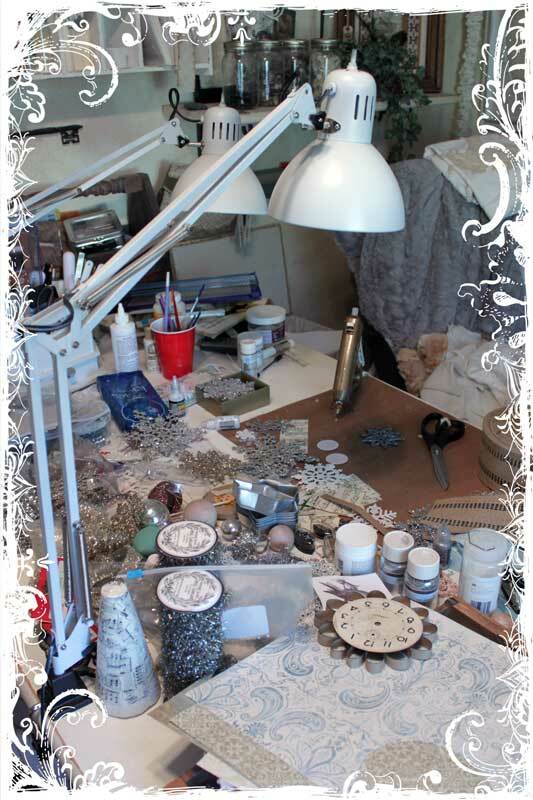 Wow, what dreamy and magical pieces you are creating! I am often "working on top of projects"-no cleaning in between-it is a challenge-it makes us stronger(hehe). Take care! Ahhhhhhhhhhhhhhhh yes, The Pinterest BUG!!!! Catching isn't it? LOVE the orniments. STUNNING! Noel is my favorite! But, they are all beautiful! Miss you! HUGS! Thanks for stopping by Karen... and yes, you really should stop by both Cottage Gardens Shops in Old Towne Glendale, they are walking distance from each other and are stocked to the rafters with amazing Treasures and Styled so Beautifully! Carol and the Shop Gals are all good Friends of mine, they are so much fun and so Talented! Enjoyed seeing all your lovelies! 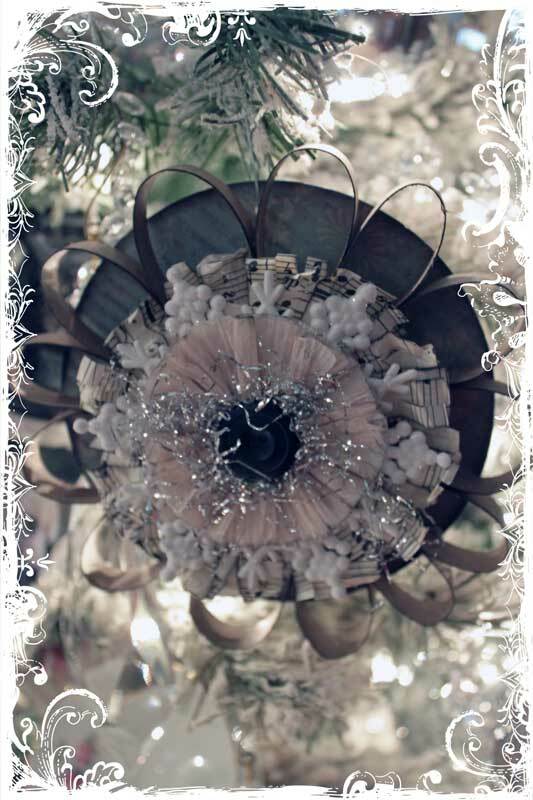 I quite like the "glitter-bomb" look;) Your ornaments are truly gorgeous...love them all!! Oh I completely understand about that tinsel and glitter bomb. I had one explode here in my house. I have sparkly messes everywhere! Your ornaments are so beautiful Karen! I just love all the old-fashioned look they have - gorgeous!! Christmas Bottle Angel and a new look for me! The Absolute BEST shop for Christmas!